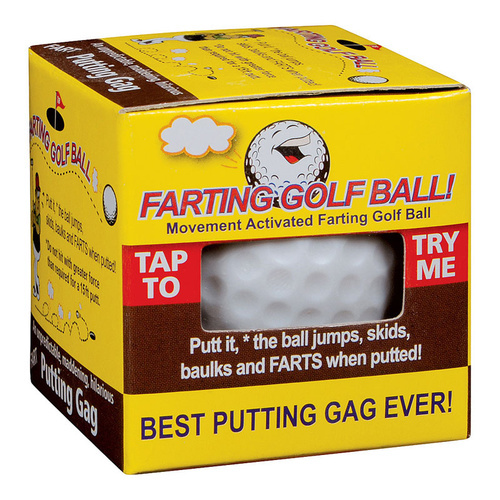 Farting Golf Ball | Makes a hilarious farting noise when struck! Makes an amusing farting noise when struck! It's unpredicable, maddening and hilarious! Looking to play a prank on your golfing buddies? Here's one that will make you laugh every time! 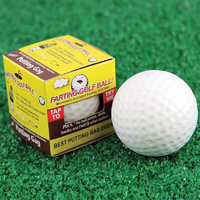 Simply make contact with the Farting Golf Ball, just like you would a normal ball for a hilarious farting sound. Watch as it jumps, skids, wobbles and farts when putted! Your unsuspecting mates won't know what to think, the name says it all! With a movement activated microchip within, this is a great gag gift for any golfer who has everything golf-related, including a great sense of humour. It looks realistic, so it's easy to swap out on the green during a round to add to the laughs. After all, isn't golf only for old farts? It's ideal for breaking the ice or lightening up the mood of a stuffy game that's getting much too serious. "Got this as a gag gift for a golf-themed birthday party for my colleague. He loved it!" "It looks just like a legitimate golf ball, not too loud, my grandfather loved his gift." Same size as a real golf ball. Do not hit with greater force then required for a 15ft putt. Great gift for any avid golfer - provided lots of laughs on the course. Good fun for the younger golfers!